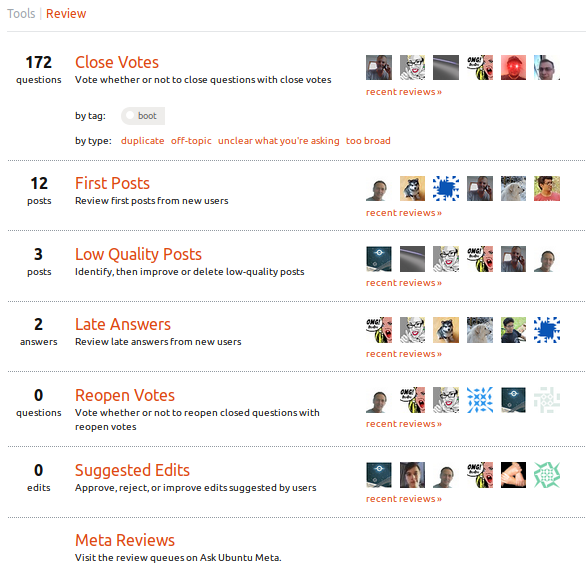 As of today, the new top bar is live for normal users on Ask Ubuntu. Previously, I was reviewing quite a lot, but now we have this new top bar, and I can't see any "review" link in it... Can anyone help me find the review queues again so I can try to make Ask Ubuntu better? I'm posting this because the new top bar caused severely reduced reviewing on Stack Overflow. 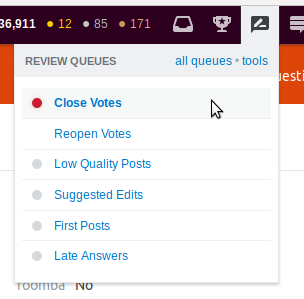 You can click the queues to go straight to a queue of your choice and start reviewing immediately, or you can see all the queues by clicking all queues. P.S. I guess it seems like once you've figured out where the review queues are then, problem solved... but SO users have reported that they find themselves reviewing less although they obviously know where the icon is. You might find that you have to remind yourself to review, since there isn't a word on the screen planting the idea of reviewing in your brain. Not the answer you're looking for? Browse other questions tagged support review review-queue top-bar .